Who Suffers From the Impacts of Climate Change? While Bill Gate’s recent opinion piece in MarketWatchfocuses on the farmers in developing nations, the answer to this question is “everyone.” Mr. Gates argues that farmers in developed nations have the technology and governmental support to manage these risks, but the impacts of climate change that begin with farmers resonate much further than the fields. Believe it or not, researchers have recently linked the Syrian conflict to a drought that was worsened by climate change. An extreme drought in Syria between 2006 and 2009 has been called the worst in the modern history of the nation. While the region, known as the Fertile Crescent, is more or less accustomed to periodic droughts, the 100 year upswing in temperatures has led to warmer and drier conditions throughout the eastern Mediterranean instead of the more preferred variability. The winds that bring moisture-laden air grow weaker while hotter temperatures deplete the little moisture there is more quickly. The rural villagers who lost their farms and livelihood to the drought crowded into cities such as Daraa, where in March 2011 the Day of Ragerally ended in gunfire from security forces and clashes throughout the city. By May of the same year, Bashir Assad had deployed Army tanks to Homs, Daraa, and neighborhoods Damascus in an attempt to crack down on the would-be revolutionaries. Now entering its fourth year, the Syrian conflict has sent millions of Syrian citizens and Iraqi refugees fleeing the country for fear of government forces, assorted militias and the Islamic State. Thousands upon thousands have fled through Turkey and Lebanon, up through Eastern Europe, striving to reach safety in Western Europe and the United States. 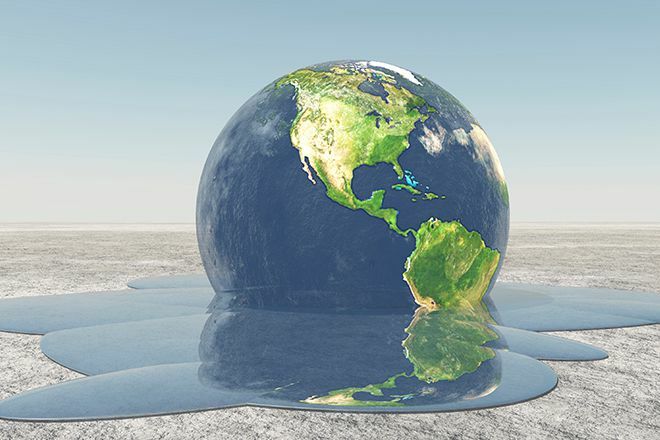 Climate change affects issues that go far beyond agriculture and economics. The impact of violent unrest and war should be just as much haunting specter as the plight of a poor rice farmer in Bihar. All of this seems obviously seems far away from South Florida, and even further from the pre-primary clown show of American politics. President Obama’s early September visit to Alaska was overshadowed by the Denali versus McKinley naming furor, despite a wildfire season in which 5 million acres of Alaska went up in smoke. For comparison, the entire state of Maryland is about 6.3 million acres. So this is basically like 80 percent of Maryland bursting into flame in a single season. Thanks, climate change! The president also took the chance for a selfie in front of Exit Glacier, which has lost 187 feet in the last year alone, and 1.25 miles since 1815. The president said that people who deny climate change exist on “a shrinking island,” but it’s a sad truth that everyone on the planet is stuck there with them as the biggest glaciers get smaller and smaller year by year. In South Florida, where approximately 2.4 million people live within four feet of their local high tide line, we are already experiencing some of the consequences of sea level rise. Flooding is no longer limited to storm surges and king tides. Tidal flooding events are more common by the season; according to the Rosenstiel School of Marine and Atmospheric Science at the University of Miami, the pace is accelerating. This isn’t an argument about politics—although it’s definitely politically charged here in the States—meaning that the water will rise whether you believe it’s going to or not. Everyone is impacted by climate change in one way or another, whether it’s as simple as the hottest summers on record or as serious as a rising sea level. With the face of the Earth itself changing in response to the shift in temperature, there’s no doubt that these effects will only increase with time. In my up and coming, soon to launch humanitarian effort, I will be addressing issues like this that impact the world.